Bhumi is a Sanskrit word for "land" or "ground," and the list of ten bhumis are ten "lands" a bodhisattva must pass through on the way to Buddha-hood. The bhumis are important to early Mahayana Buddhism. A list of ten bhumis appears in several Mahayana texts, although they are not always identical. The bhumis also are associated with the Perfections or Paramitas. 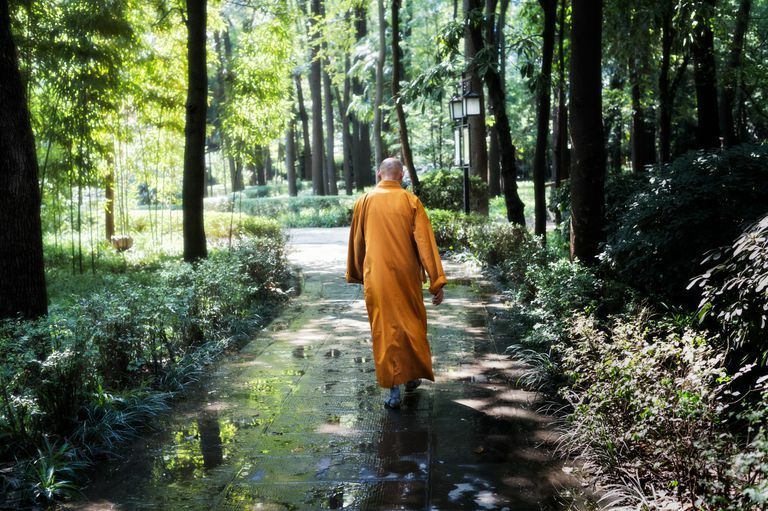 Many schools of Buddhism describe some kind of path of development. Often these are extensions of the Eightfold Path. Since this is a description of the progress of a bodhisattva, much of the list below promotes the turning from concern for self to concern for others. In Mahayana Buddhism, the bodhisattva is the ideal of practice. This is an enlightened being who vows to remain in the world until all other beings realize enlightenment. Here is a standard list, taken from the Dashabhumika-sutra, which is taken from the larger Avatamsaka or Flower Garland Sutra. The bodhisattva begins the journey joyful with the thought of enlightenment. He has taken bodhisattva vows, the most basic of which is "May I attain Buddhahood for the benefit of all sentient beings." Even at this early stage, he recognizes the emptiness of phenomena. In this stage, the bodhisattva cultivates Dana Paramita, the perfection of giving or generosity in which it is recognized there are no givers and no receivers. The bodhisattva cultivates Sila Paramita, the perfection of morality, which culminates in selfless compassion for all beings. He is purified of immoral conduct and dispositions. The bodhisattva is now purified of the Three Poisons. He cultivates Ksanti Paramita, which is the perfection of patience or forbearance, Now he knows that he can bear all burdens and hardships to finish the journey. He achieves the four absorptions or dhyanas. Remaining false conceptions are burned away, and good qualities are pursued. This level may also be associated with Virya Paramita, the perfection of energy. Now the bodhisattva goes deeper into meditation, as this land is associated with Dhyana Paramita, the perfection of meditation. He pierces through the darkness of ignorance. Now he understands the Four Noble Truths and the Two Truths. As he develops himself, the bodhisattva devotes himself to the welfare of others. This land is associated with Prajna Paramita, the perfection of wisdom. He sees that all phenomena are without self-essence and understand the nature of Dependent Origination -- the way all phenomena arise and cease. The bodhisattva acquires the power of upaya, or skillful means to help others realize enlightenment. At this point, the bodhisattva has become a transcendent bodhisattva who can manifest in the world in whatever form is most needed. The bodhisattva can no longer be disturbed because Buddha-hood is within sight. From here he can no longer fall back to earlier stages of development. The bodhisattva understands all dharmas and is able to teach others. Buddha-hood is confirmed, and he enters Tushita Heaven. Tushita Heaven is the heaven of contended gods, where there are Buddhas who will be reborn only one more time. Maitreya is said to live there also.